Box Archaeological and Natural History Society (Box NATS) was conceived over 45 years ago by a couple of 16 year-old Box A-level students with an enthusiasm for natural history and the history of the village, Richard Hodges and Alison Borthwick. They were inspired by the 1967-68 excavation of Box's Roman Villa when the Selwyn Hall was built and a series of lectures given by the Workers' Education Association. Richard and Alison ran the society for the first two years until they both left to go to university in 1970 and the society was quickly obliged to establish its own, secure roots. From the outset, it had serious ambitions and it evolved into a research and dynamic interest group as well. It saw its purpose as the revitalisation of the very heart of Box, the understanding and conservation of the rural character of the village and beyond. The full list of committee officers is given below and the success of the organisation is due in considerable part to the hard work of this small band of organisers as well as the enthusiasm of the people of Box. The society was formally constituted in February 1969. The enormously wide range of activities was shown from the start and all seemed well. But, as the report below shows, the resolve of members was tested from the outset and villagers had to show their mettle. Richard Hodges (in his role as field secretary) reported: We had a stimulating first field event with Mr Grant King,  who led a marvellous expedition along the Wansdyke. Though it snowed, hailed, rained and blew before the sun shone, and despite several members getting lost, one member said afterwards, "it was a privilege to be involved in such an event." That rather sums up the attitude of resilient fortitude of all who still enjoy the society's activities. The range of events can be seen in the first year's programme of events. Outings included a botany walk from Rudloe to Weavern by Mrs Joan Swanborough, which recorded over 90 species of flower. Mr Henry Hurst (the chief field archaeologist of the Selwyn Hall site) gave a tour around Chedworth Roman Villa followed by the excavations in Gloucester and Mr HG Ward guided a Fungi Foray with picking instructions in the Savernake Forest. Vicar Tom Selwyn-Smith and Stuart Hills of Ditteridge led a group walk on a little pilgrimage around Hazelbury Manor and Chapel Plaister. Vicar Tom was always a great supporter of the organisation. There were many more trips: a Stubble Walk over Ditteridge Plain, across Marlborough Downs to keep a footpath open, to Devizes Museum to view the 1901-4 Box Roman Villa exhibits and a coach outing to view bird life in Chew Valley Lake. The talks that year also set the tone for the diversity of projects. They were started by Professor R Atkinson who gave a lecture about Silbury Hill. This was followed by Butterflies, Flora and Box Parish and a later one concerning excavations by Mr Hurst in Mr Hughes' garden, both being held at the school. Perhaps the highlight was a talk to an audience of 60 in the newly-finished Selwyn Hall by two speakers: Mr Kenneth Hudson, who spoke about industrial archaeology; and the Box Caving Club, who described the quarries under Box Hill. All of the hard work and commitment achieved success and the year was crowned off by a report from Mr Grant King. He confirmed that Wiltshire County Council accepted the Marlborough Downs footpath should be maintained, adding that the NATS' walk had swung the balance, and that access gates had now been installed in the barbed wire fence along the Wansdyke. What a start that was and of course it fired the imagination and enthusiasm of people to join! There is simply too much to record the details of every year, so the following is an extract of the organisation's activities. The driving forces behind the original society were, of course: Richard Hodges, who called himself Field Secretary but had a finger in most of the activities; and Alison Borthwick, who was the secretary and leader of many of the field walks. It was their youthful enthusiasm that encouraged such a huge programme of events in the first year, but within 24 months they had both gone away to university and Box Nats was left to fend for itself at least during term-time. Fortunately there was sufficient foresight to establish a formal committee, without whose efforts there would be no NATS today. Frank Hughes agreed to be the first chairman and it was in his garden at The Wilderness that the 1967 Roman excavation had taken place. Roy Hodges was the stabilising influence as treasurer and founder members included Miss Gillian Huggins, Miss Edith Woolford and Mr George Scott. By 1975 presidential roles were added: Mr D Grant King president and Mr Henry Hurst vice-president (later joint president) in recognition of their assistance in the early days. When Frank Hughes was unable to continue in 1979, Roy was appointed chairman in his place and Frank was promoted to president with Richard Hodges and Alison Borthwick as vice-presidents. Alison became president in 1990 but sadly passed away in 2001. By 1976, Richard Hodges was working as a lecturer at Sheffield University and was awarded an OBE in 1995. It is greatly to his credit that he has never forgotten his early days in Box and still presides over the society, despite currently living abroad. In the first year, annual membership fees were £1 for individuals, £1.50 for married couples, 50p for students and 25p for children (although the society actually started in the days of old money pre-decimalisation). By the end of 1970 there were seventy members enabling rates to be kept on hold until 1980 when they rose by 50p. The programme of events was established from the very first year as: Meetings are held at monthly intervals. During the winter indoor meetings are held which include illustrated talks, film shows etc and in the summer outings and visits are planned. Visitors are welcomed to any of the meetings. The plan was to mix local field walks and visits with coach outings as was considered suitable for different times of the year, distinguishing summer outings from winter walks. Special mention has to be made of the work done by committee members to promote the society so well in the Parish Magazine, Chippenham News and other local press. It is partly due to their efforts that membership has continued to run at high levels and attendance at meetings has thrived. Research of the village has been an integral part of the NATS' work from the beginning, every bit as important as having some highly entertaining talks and outings. There were three distinct (and increasingly professional) attempts to undertake a flora survey in Box in the early years. On 18 June 1977 the Chippenham News reported, Twenty members carried out a point botany study along the By Brook at Box and on Kingsdown. 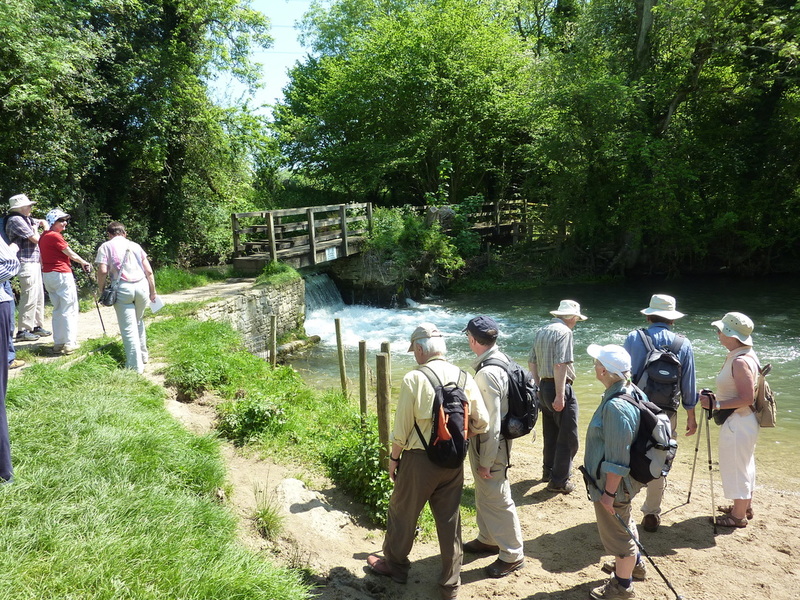 The party walked from Box to Shockerwick via the brook, and by footpaths to Kingsdown. The party were unexpectedly pleased to record 25 specimens of the common spotted orchid. It was the precursor to a whole series of Botany Research Walks after 1980. The 1979 programme of events was distinguished by the introduction of Botany Survey Walks. It was recognised that Mrs Joan Swanborough's field expeditions could be developed into useful local research. 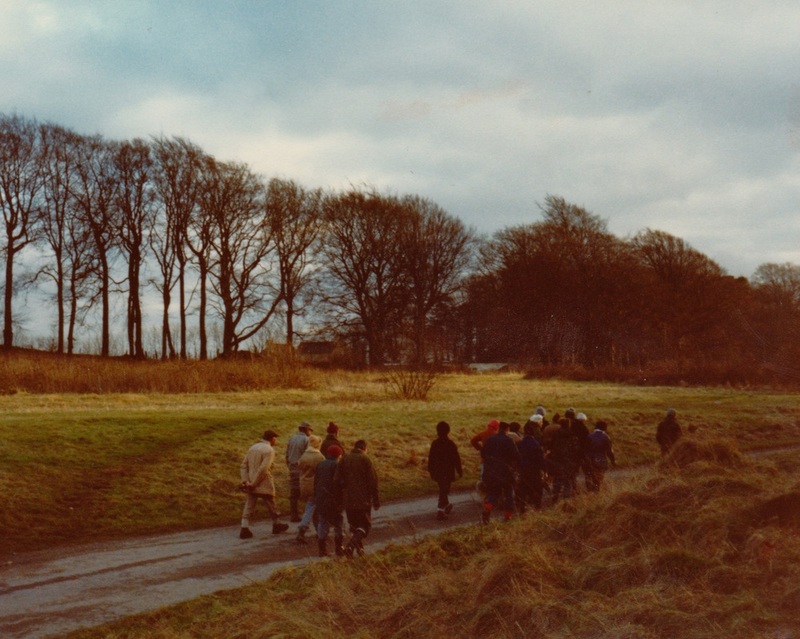 Following a lecture by the Botanical Society of the British Isles, Box NATS organised a programme of twelve walks in the summer of 1979, starting in March co-ordinated by Joan Woodgate. The botany of Box Hill Common was the subject of the 1981 survey. It had been purchased by the Parish Council two years earlier so that it could remain for the use and pleasure of everyone, for always. Seven walks were arranged but the first walk in April had to be cancelled because of a heavy snowfall and the last one in October abandoned because of a very wet period which caused all the flowering plants to die early. Nonetheless the survey is still the definitive report on Box Hill Common, recording a total of 202 natural flowering plants. At the 1984 Annual General Meeting, before eighty members, Roy Hodges announced an initiative by Joan Woodgate for an eight-year Wiltshire Flora Mapping project under the guidance of the Wiltshire Trust for Nature Conservation. It was the most ambitious project that the society had attempted to date. There were many Footpath Walks organised by the NATS and led by Barbara Higgens in the years after 1977. The objective was to set-up a regular recording group within the Parish in conjunction with Wiltshire County Council. It was supported by the Parish Council who in 1977 declared they wished to encourage this and to make it possible for more use to be made of the 89 footpaths in the parish. The council organised signage and issued a pamphlet Footpaths Around Box, written by Barbara Higgens. The NATS committee undertook the organisation of trying to walk every single path on a regular basis and members helped with maintenance, cutting back of hedges and weeding. In February 1978 five members joined together to construct stiles. By 1996 the walks had taken a life of their own and the organisation of them was devolved back to the Parish Council. The field walks initiative coincided with a Wiltshire aerial photography programme which was discovering evidence of abandoned buildings and medieval villages. Box NATS gave this renewed impetus locally by being able to explore on the ground to date sites and see what evidence is readily available to the informed observer. 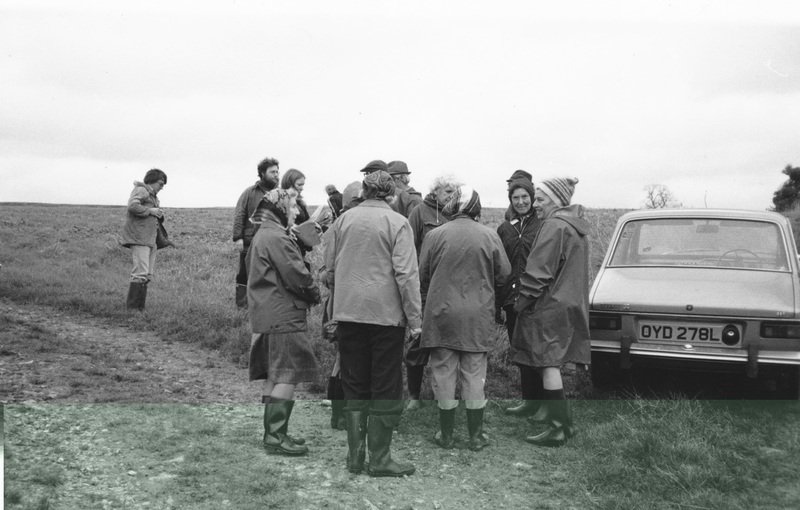 The first Archaeological Field Walk was on 30 October 1977 around Ditteridge Valley. It discovered shaped flints, fragments of Roman pottery and medieval shards. Many of these walks were led by Alison Borthwick and John Mortimer, who organised washing field finds, identifying sessions and mapping the location of finds. Most of this work was done at the end of the walk in the Scout Hall, Box. 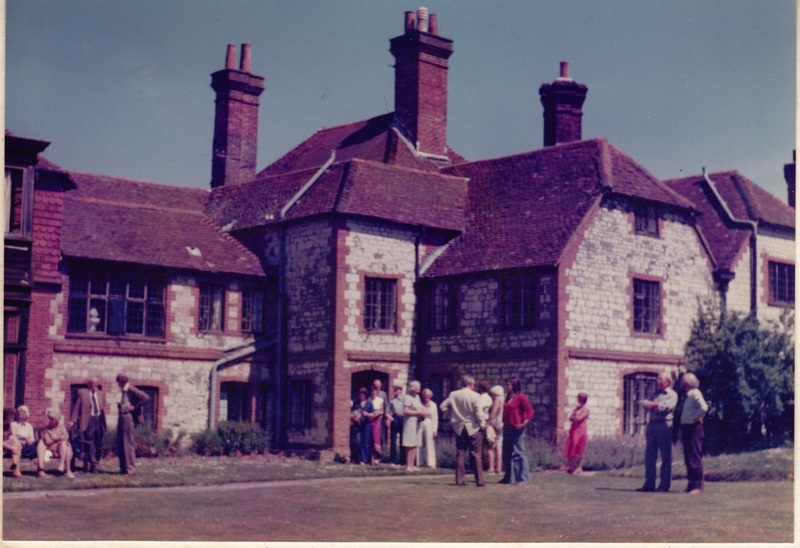 In June 1978, forty members went to Selborne, Hampshire, to discover more about the Rev Gilbert White (1720-93), whose book on Natural History is the fourth most published book in the English language. They visited Wakes, his home, now a museum of his work and that of Captain Oates who sacrificed his life in the 1911 Scott expedition to the South Pole. More active members made the 300 foot climb up the chalk hillside to the Hanger to see the beauty of the village that Gilbert knew. That season was one of the best ever with marvellous outings to Portland Bill and Radipole Lake Reserve in April and Ironbridge Gorge and Museum in September. The Radipole trip saw a very rare visitor to Britain in the shape of the Alpine Accentor, a relative of the hedge-sparrow but more colourful. It was said to be quite unperturbed by the spectators. The Ironbridge visit included a number of local sites and the cottages where the workers of the famous Darby family lived. 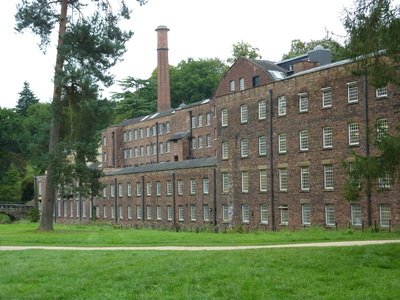 The visitors went to the Coalport factory complex where delicate china was still made and decorated. And one of the highlights was a visit to the famous 200-year old bridge over the River Severn, where they met Eustace Rogers, the last coracle-maker in England. It was a step back in time for members of Box NATS and one which was ong remembered by those who went on the trip. The outings were so popular that after 1990 it was decided to go further afield with weekend breaks travelling by car until 2002 and then by coach and staying away for up to three nights. In 2012 the weekend away was based in Chester. The first stop was in Hereford for a guided tour of the Cathedral and a visit to the Mappa Mundi and chained library. 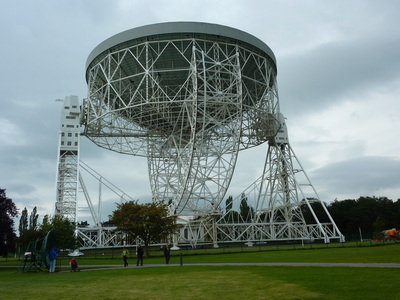 Then off to Jodrell Bank to enjoy the new visitors' centre. 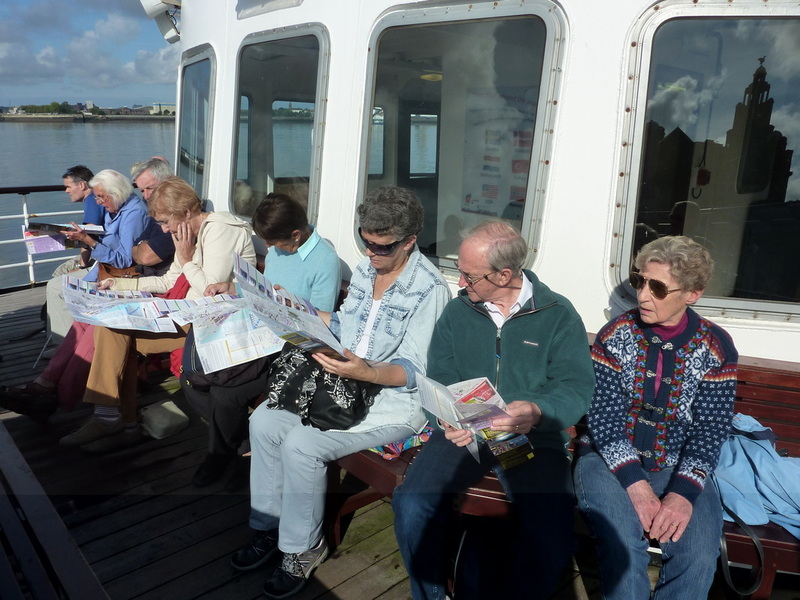 The weekend continued with a tour of Quarry Bank Mill and a ferry ride across the Mersey. Sunday ended with a tour of the Tudor mansion, Speke Hall. On the way home we visited Ludlow to view the castle and the stained glass windows of the parish church of St Laurence. This spirit of adventure inspired even more ideas and the concept of a trip planned and organised by the Vice-President was greeted with great enthusiasm. 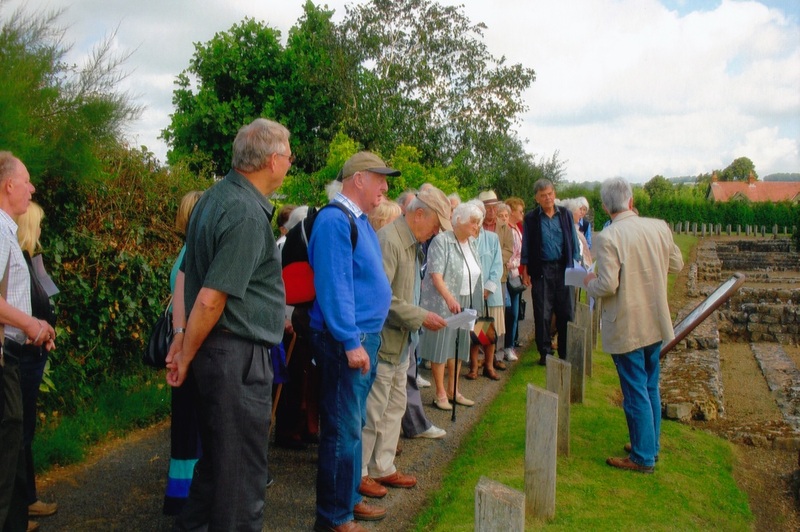 The V-P trips have taken on a sense of the unexpected, particularly under the initiatives of John Chandler, as well as offering members the opportunity to hear from, and discuss with, a professional historian. 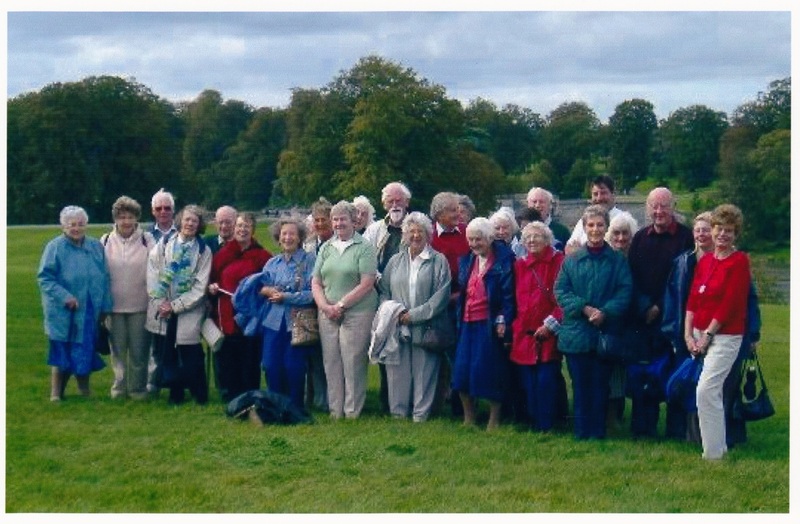 In July 2011, John took the Society to Wales to view the Caerwent Roman ruins and visit to Monmouth. Caerwent (Venta Silurum) was founded in AD 75 as a market town and a legionary fortress where there still can be seen the forum, basilica and a temple. Monmouth is a medieval town on three sides of the river Usk and the birth place of Henry V.
There are too many to record thanks to each and every speaker but here are just a few that caught my imagination as being unique in their subject matter. Mr W Ford gave a talk about a more scientific approach to archaeology. He spoke about the work of his laboratory team in Trowbridge, repairing and conserving artefacts of historic interest. They had started work on the Pitt Rivers Museum collection and Mr Ford illustrated his talk with reference to local material from Ditteridge. He went on to show aerial photographs and how they can help identify sites of historic interest. It was all very new in those days of great interest to the audience, who thoroughly enjoyed the evening. 1 inch over the last 2,000 years whilst females had increased by this amount. Two films were shown about water: On Tap, a descriptive documentary on the subject of water supply by Mr Miller of Bristol Waterworks Company, and Man-made for Nature, by Maurice Tibbles, formerly shown on BBC Horizon series. This film was a delight to the eye and an encouragement for the future, showing that it is possible to reconcile development of a natural resource with wildlife conservation. 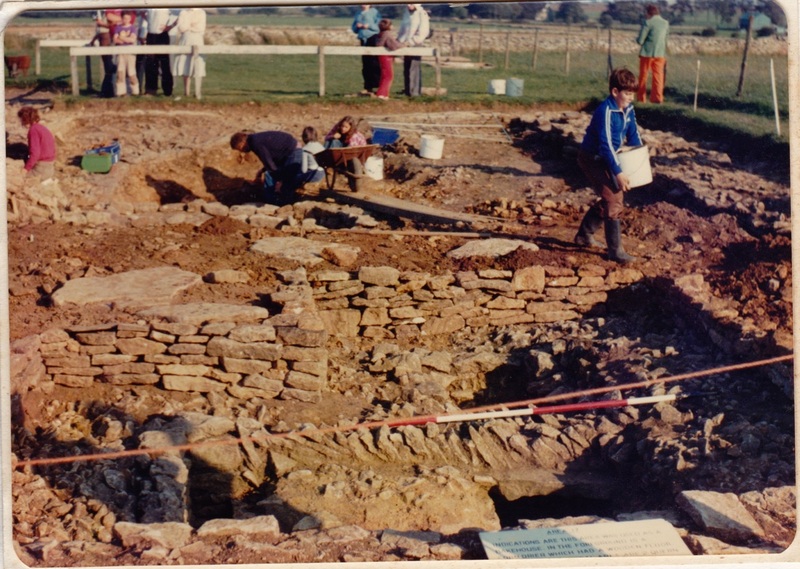 Many times members joined with excavations outside the village at Trowbridge, Bradford, Potterne (left) and various other local sites. But it was the local work on Box's Roman Villa that really caught people's attention. After all, it was the 1969 excavations at Selwyn Hall that had given birth to the society in the first place. In the summer of 1982 drainage repairs were needed at the Wilderness and a chance to examine the site comes with the repair of the pond which served the medieval mill that was built on top of the villa. Kate Carless invited thirty members to look around the dig in April 1983. From a trench at the Hermitage, 114 pounds of shards and animal bones had been removed from a undisturbed refuse pit of Roman times. At The Wilderness, the outstanding achievement was a complete Samian bowl. There have been a number of one-off activities that Box NATS have initiated. One such was the publication of a brief history of the village. The original plan was to have many contributors but it ended with Richard Hodges writing Box Parish: A Short History as part of the Council's appraisal review in 1975. It still remains the most complete review of Box's story. In 1980 a party of forty students from Sheffield University's Department of Prehistory and Archaeology was accommodated by members to the mutual satisfaction and enjoyment of guests and hosts. It was a very successful weekend. It was led by Richard Hodges and his colleagues and was subsequently repeated. The Fungi Forays produced some interesting specimens for consumption and in October 1984 the foray to Thickwood, Colerne, amassed a list of 51 species as well as an entertaining talk by Mr Gordon Ward. Under the inspiration of Ronnie Walker, the society revisited its archaeological roots in the early 2000s culminating in the formation of KOBRA (Knowledge of Box Roman Archaeology) and Box NATS publication of Mark Corney's fascinating book The Roman Villa at Box in 2012. The whole project was broad-ranging with a scholarly study of the village site being written and distributed to universities and archaeological institutions, a model of the site (still on display in Box library) and an educational fund for Box school children. The enthusiasm for Box's history and the natural history of the world is undiminished since the earliest days of the society; perhaps even enhanced now by environmental and conservation issues. These issues concern us all and we all need to raise our involvement. Box NATS offers a platform to understand the past and the present and to take part in enjoying its survival. It isn't easy for a society to be both professionally driven and open to all ideas and suggestions from members and interested parties. That rather idealistic objective has helped to keep Box true to its roots and faithful to the concepts of the founders of Box NATS, particularly Richard Hodges and Alison Borthwick. Mr Grant King had been involved in the restoration work at Avebury with Alexander Keiller in 1938. Gill Huggins was secretary for 8 years; Edith Woolford was treasurer for 10 years; Frank Hughes was involved for over 10 years and later a tree was planted at the top of the Rec in his memory.